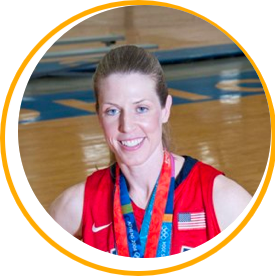 Katie Smith is a 3-time Olympic Gold Medalist, the all time leading scorer in Women’s Professional Basketball, a 2-time title holder in the WNBA, a 7-time All Star, a member of the WNBA All Decade Team, one of the Top 15 Players of all time, and a member of the WNBA Top 20@20. She is also the Head Coach for the WNBA’s NY Liberty. It would be easy with that resume to let it go to your head, but Katie doesn’t. She’s so down-to-earth. We talked to her about her fantasy dream team, her influences growing up and what she’s looking forward to as she transitions to the Head Coach role. Her Last Call Advice is a game changer, so make sure you hang in there until the end. 14:39 Is your number on the wall? Are you going to the Olympics?! 17:07 Fantasy Draft: Who does Katie pick for her all-time dream team lineup? 18:41 Turning the page from player to coach – how has the game changed and how do you adapt to that as a coach? 22:10 I’ve had mine. This is your life, you get yours! #200prooflife! 25:57 You kept your Athens gold medal WHERE? 27:48 Do you realize that just by being you, you inspire people? 32:09 Katie didn’t plan for basketball to be her career. What did she have planned? 36:44 We are getting our championship rings! 37:29 Why is giving back important to Katie? 39:18 What’s that sitting on the table with us? 41:54 Find out what Katie’s advice is for getting closer to a 200 Proof Life.